The Art Outreach Gallery is again offering FREE arts-based youth workshops! 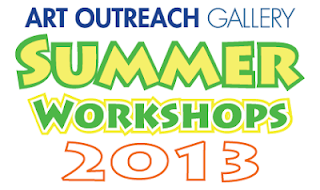 Workshop program booklets and registration forms may be picked up at Eastwood Mall information desk. Questions? Comments? Suggestions? Please see Art Outrech Gallery contact numbers at left!